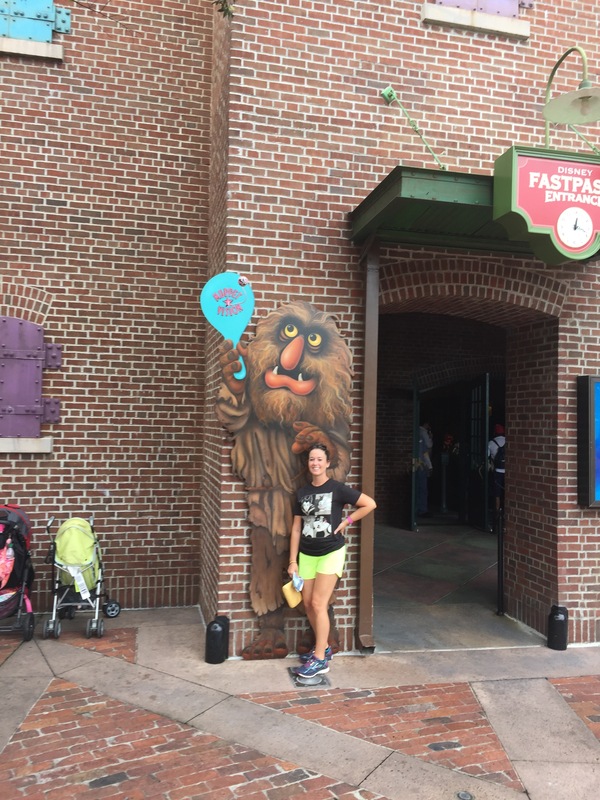 Orlando – Biscotti and a Ph.D.
I’m getting one more quick post in for 2018! And just like the post from Epcot, this one is again focused on delicious snacks you need to eat, but this time at Magic Kingdom! Of all the parks, Magic Kingdom, to me, seems to have the least appealing sit-down restaurants (I’m no fan of buffets and that’s what a lot of them seem to be), so snacking is my go-to at this park. I had never been to Animal Kingdom, so I was looking forward to this day (and also dreading it because it was our last day). This was the only day we had any type of bad weather. As soon as we got inside there was a downpour, but we huddled inside a store, the rain passed in about five minutes and cleared out the park for most of the morning, which was really nice! We headed straight for the park’s only roller coaster, Expedition Everest. Because we were there as soon as the park opened and thanks to the iffy weather we managed to walk right through and get on the ride three times in a row. Watch our for the Yeti! Seriously, so beautiful. It’s easy to forget you’re in the middle of Orlando from this view. The park was still somewhat empty, so we strolled on over to Dinoland. Most of the Dino area was closed off and DINOSAUR was closed which limited the number of thrill rides for the day. There was no one in line for Primeval Whirl, which is a low-key roller coaster with spins that we LOVED. People probably thought we were on something because we laughed so hard during the whole ride! Here’s another picture of the cool scenery to balance the terrifying picture from above. I tried to talk boyfriend out of the Kali River Rapids because I knew I’d get soaked, but he really wanted to ride it. Like the rest of the park, it had really cool décor and atmosphere, and I definitely did get soaked. Other than having wet pants, it was an enjoyable ride and we had a blast laughing and chatting with the friendly Canadians in our raft. 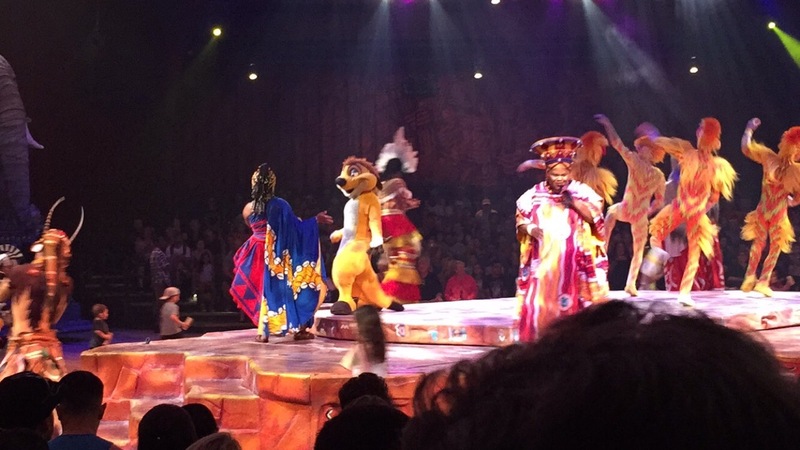 Of all the shows at all the parks, Festival of the Lion King was our absolute favorite! I was too focused on enjoying the show to get good pictures, but the one above gives you an idea of the set-up. Everything about the show was INCREDIBLE (and the singers are so amazing)! Go see it! After looking at several menus during my planning days, I kept getting drawn to Yak and Yeti, so I made our lunch reservations there. Disney’s site describes it as pan-Asian and you can check out the menu here. 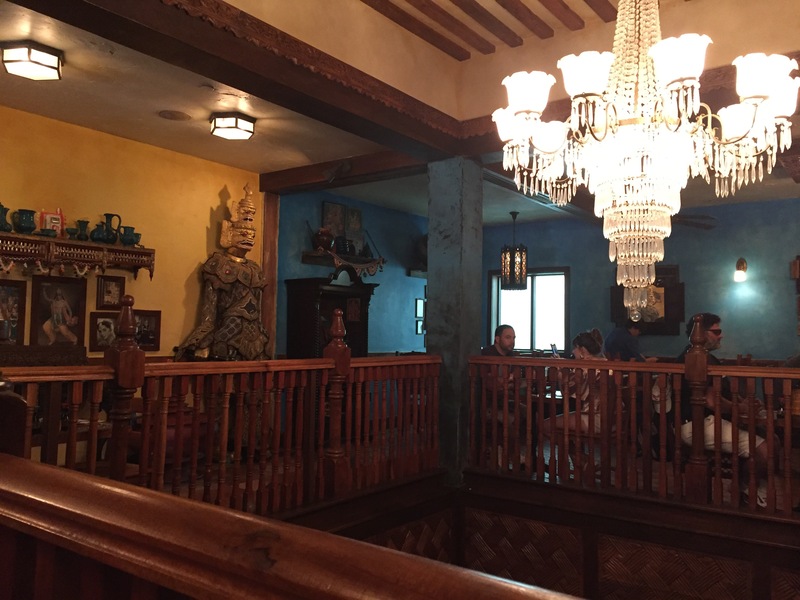 The food and drinks were delicious and filling, and the decor of the restaurant was beautiful. There’s also a fun little backstory about the restaurant here. We started off with the Dim Sum Basket for Two. It contained pork pot stickers (my favorite! 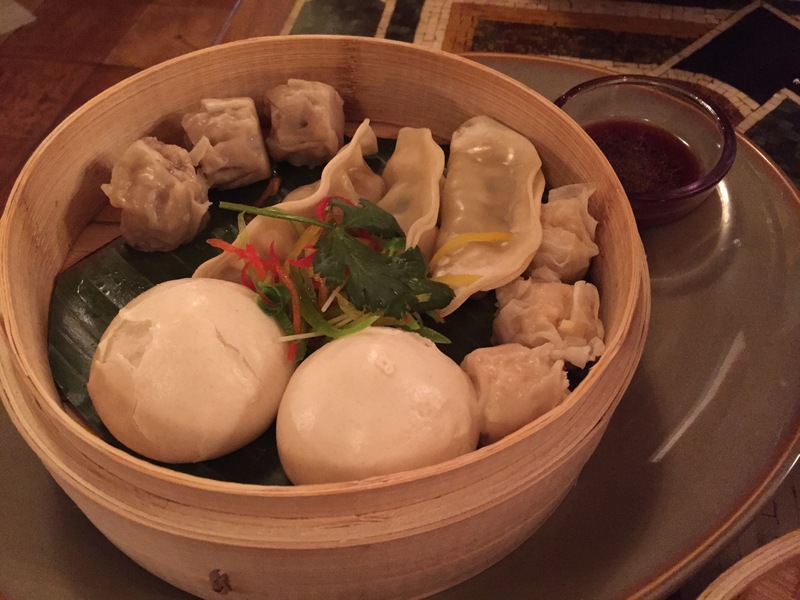 ), shrimp sui mai, cha su bao (the two things that look like eggs), and pork sui mai. I don’t know what any of that means. 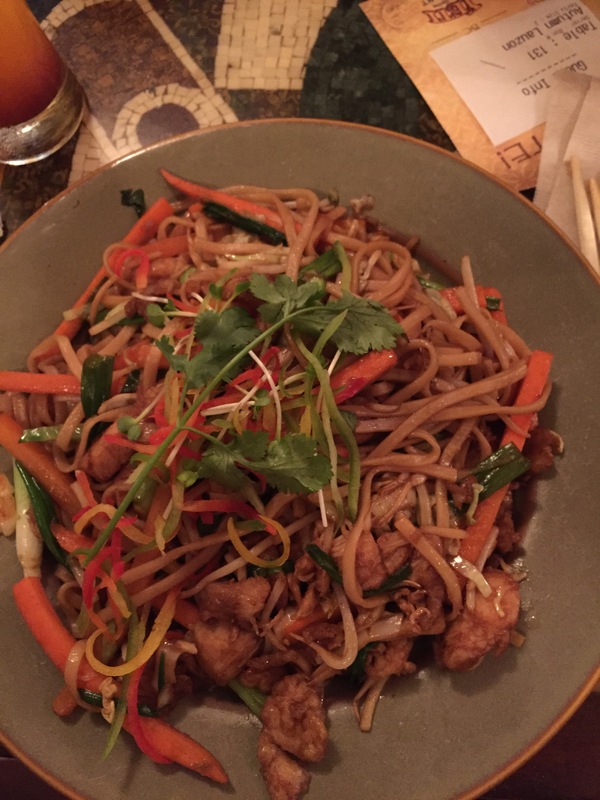 I had the Chicken Lo Mein (so much food!). I honestly don’t remember what boyfriend ordered…honey or sweet and sour chicken? And you most certainly need a Yak Attack (a mango daiquiri with rum and mixed berry flavors). See? Look at how happy it made me! 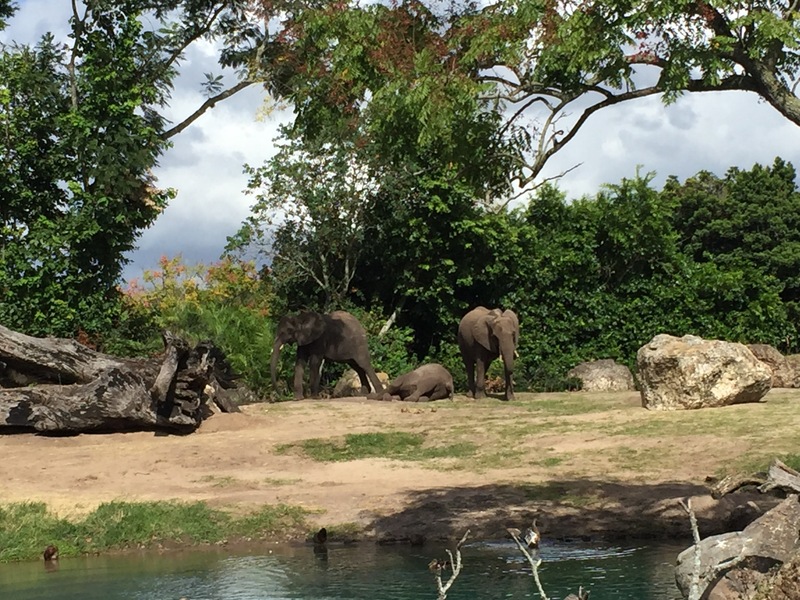 We went on the Kilimanjaro Safari around 2:00 in the afternoon. 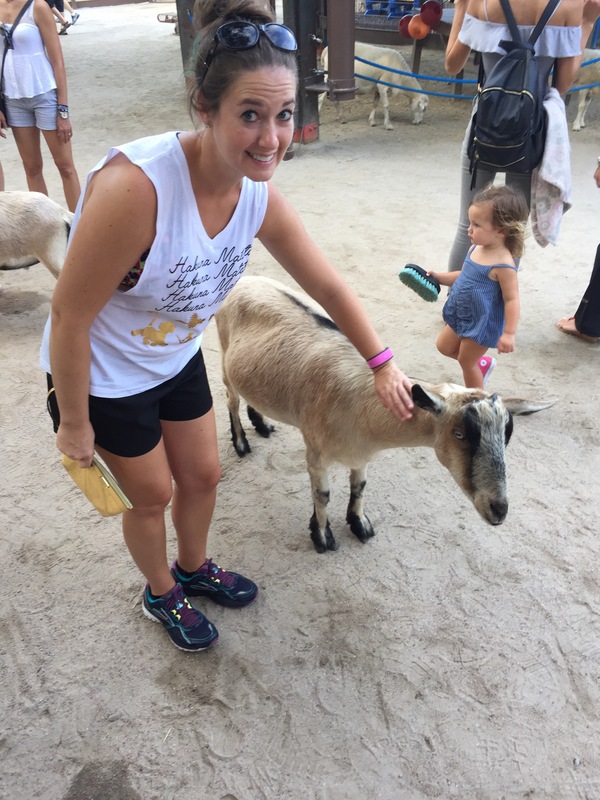 Based on my research, this was one of the best times to see all the animals. All the suggestions were correct! We managed to spot every animal on the tour and even had to stop while an ostrich crossed the road in front of us (and just like the chicken, he too was just trying to get to the other side). It’s Tough to be a Bug! is in the Tree of Life (below). I don’t like bugs, so this was actually a little traumatic for me. Boyfriend thought it was funny because of the different effects, but I will never do this again. I already live in fear of roaches; I don’t need to feel like they’re crawling on my back, thanks. We then took the Wildlife Express Train to Rafiki’s Planet Watch to play with some animals! 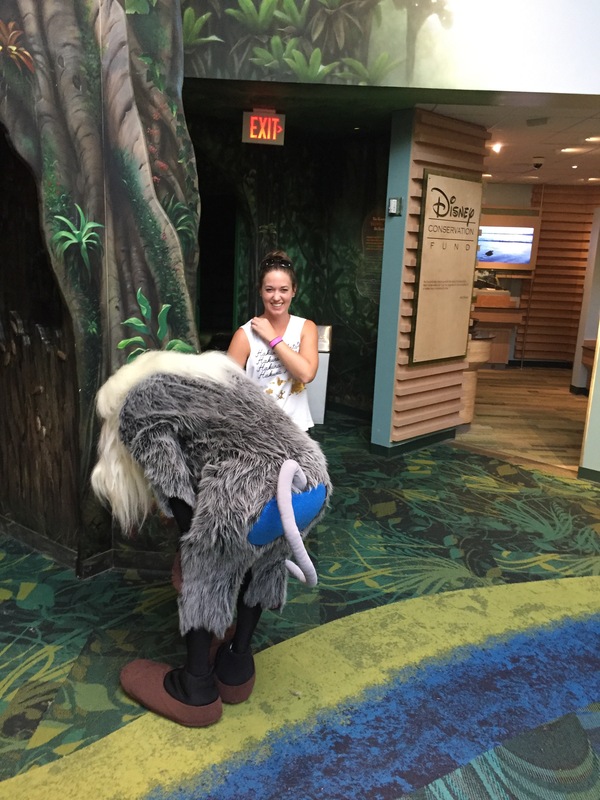 I was SO EXCITED when Rafiki was waiting inside! 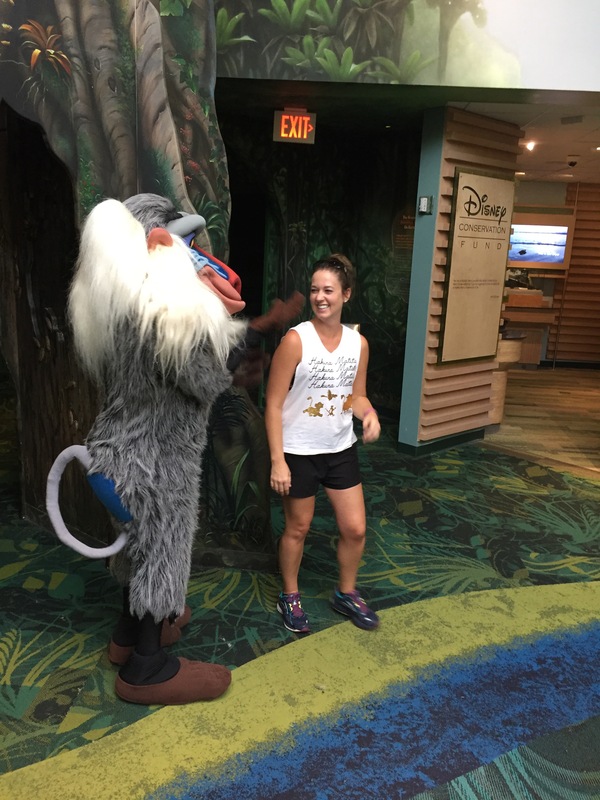 Whoever plays Rafiki must not get very much adult contact because s/he spent way too much time with us (and I think the mom in line behind us was getting annoyed #sorrnotsorry). 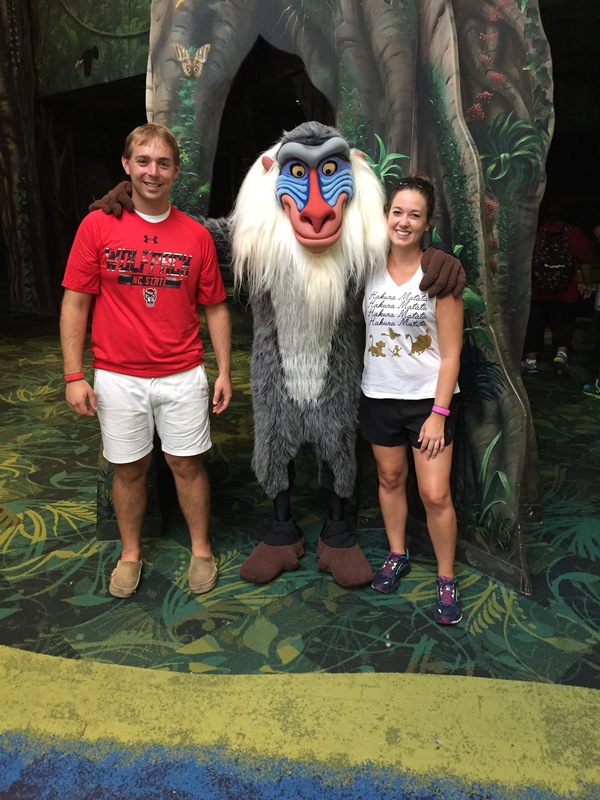 This was also the day NC State choked to Clemson, so the picture below is Rafiki giving boyfriend a really hard time about the game. This lasted an uncomfortably long time. Once Rafiki got it together, we took the train back to the park and made it to our last show, Finding Nemo – the Musical. This was also a really well-done show, but I started getting sleepy. It was also kind of weird because there were a ton of songs, and you’ll be super confused if you’re expecting the show to mimic the plot of the movie. Animal Kingdom closed around 5 that day, but we ended up leaving a little earlier. After a quick shower and clothes-change, we headed to Disney Springs (it used to be Downtown Disney) via the boat from our hotel. Disney Springs was PACKED. It was a Saturday night, so we knew there would be a ton of people out, but by this time in the week my patience with people had run out. I don’t have a lot to begin with, but a week of screaming kids and rude adults had worn on me. We had dinner and drinks at the bar at Paradiso 37. The atmosphere was a little too college-spring-break for me, but if you like really loud music and watching older men stare at women in teeny tiny flamenco “outfits,” it might be the place for you! 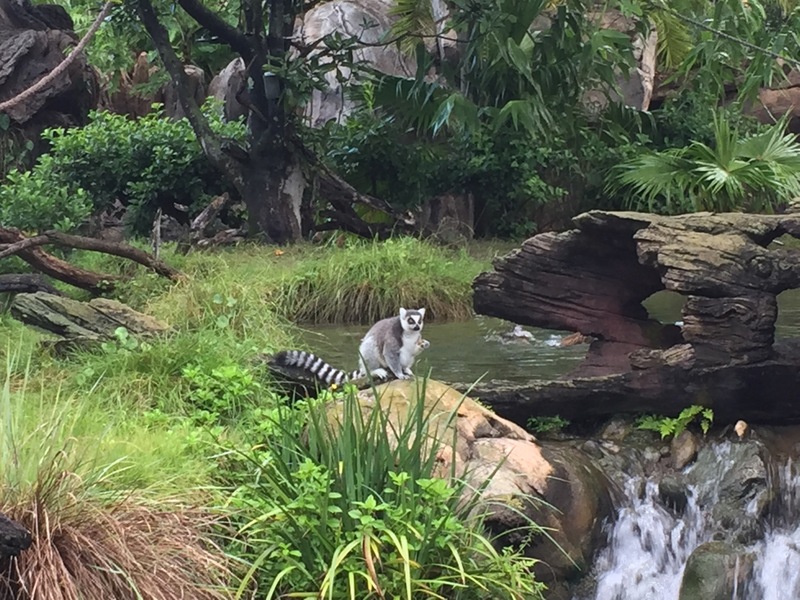 What are your favorite things to do at Animal Kingdom? Do you have a favorite restaurant or snack? 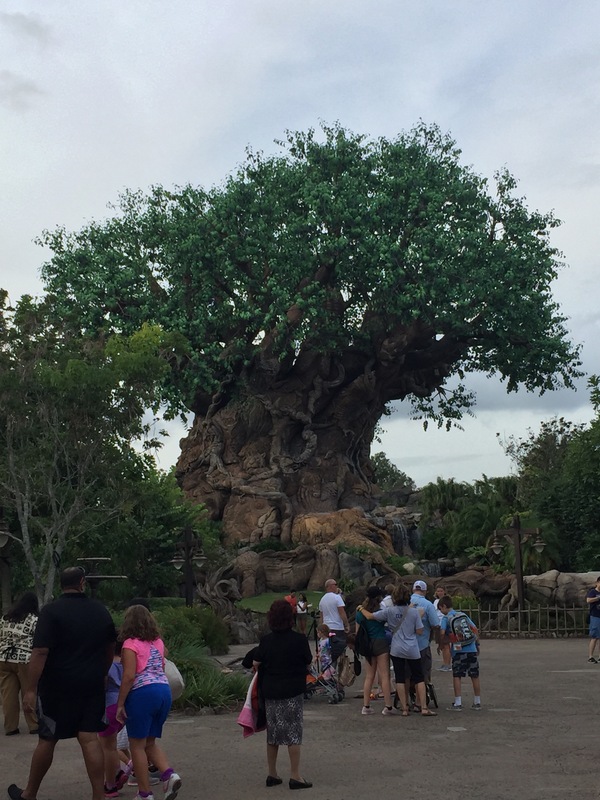 Animal Kingdom’s brand new area, Pandora – The World of Avatar opens next month! Let me know what you think if you’ll be visiting! I have a hard time not calling this park MGM since that’s what it was when I was a kid. Whatever name it is, that’s where we went on Friday. Also, is anybody else really upset that the Behind the Scenes Backlot Tour is gone? DEVASTATED! I anticipated from past experiences and from my months of research that this park would have the shortest list of must-dos – there are definitely more shows than rides. I was right, but we still managed to have a busy, jam-packed day. Luckily, Disney is currently working on two entirely new sections dedicated to Star Wars (coming in 2019) and Toy Story. Until one of those opens, I’d probably give only 1/2 a day to this park. We then made our way to The Great Movie Ride. Boyfriend had also never ridden this one (seriously, what did he do when he came to the parks?? ), and this one also has a special, nostalgic place in my heart because my parents really like it. My dad loves Muppet*Vision 3D, and I think I love it because he loves it so much. It’s a show we ALWAYS went to at Hollywood Studios. Boyfriend had never been, so it was fun taking him to another attraction that has a special place in my heart. The show gets even better when you sit near older men who literally LOL throughout the show. Since Hollywood Studios is becoming super Star Wars-focused, one of the shows is Star Wars: A Galaxy Far, Far Away and takes place in front of the Chinese Theater. We timed our “lunch” and the show perfectly and managed to score a table within eyeshot of the show. A little later we plopped down on the side of the street for the March of the First Order, which is literally just a march of Stormtroopers up the street. Or digest and make room for a funnelcake! When your boyfriend tells you he “just wants a beer” and you choose a funnelcake with chocolate sauce, ice cream, and strawberries, do not believe him. He will not hesitate to eat half of your funnelcake. Our funnelcake and beer break (that sounds disgusting) was close to the Indiana Jones Epic Stunt Spectacular so we could scoot in before it got filled – and we almost cut it too close but still ended up with great seats close to the front. We got through Star Tours – the Adventures Continue thanks to a FastPass. This ride feels a little dated even though they’ve updated the story to include characters from the newest Star Wars movies. After Star Tours we made our way to the other side of the park for Toy Story Mania! which is another shooter ride (I LOVED this ride!). We had a FastPass, but when we arrived the ride was down. We tried to wait it out (and shout-out to the cast members who passed out bottles of water! ), but when they realized it was going to take longer than they thought, they told people in the FastPass line to come back later and our passes would be accepted whenever we came back. Boyfriend had seen Mama Melrose’s Ristorante Italiano (menu here) when we were near Muppet*Vision and apparently couldn’t get pizza out of his head. I really have to be in the mood for Italian, but he’s so sweet, easygoing, and willing to let me be my control-freak-self that I couldn’t argue with him. It’s probably a good idea to get reservations; we got lucky with only a short wait, but I can imagine on busy days you probably can’t get near this restaurant. The food was delicious (see below), the atmosphere was charming, and our waitress was super sweet and delightful! 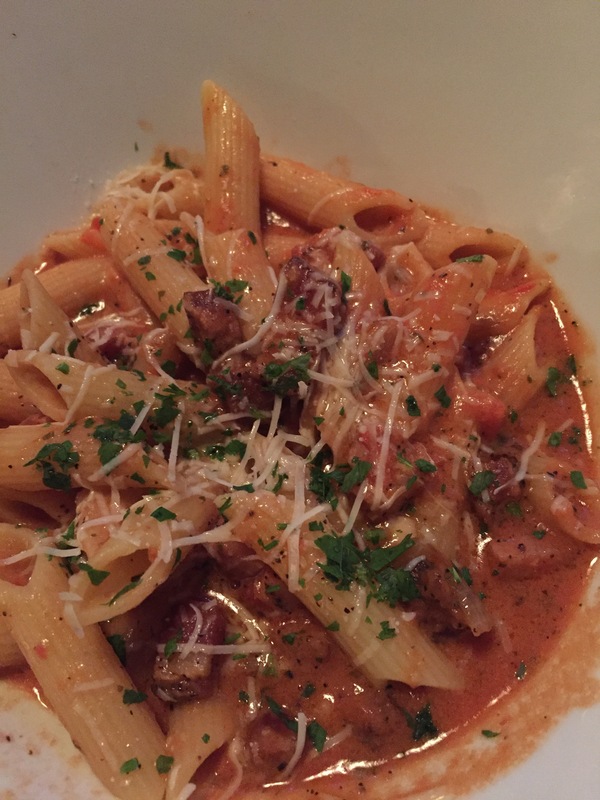 I had the Penne alla Vodka (hello little delicious pieces of pancetta!) 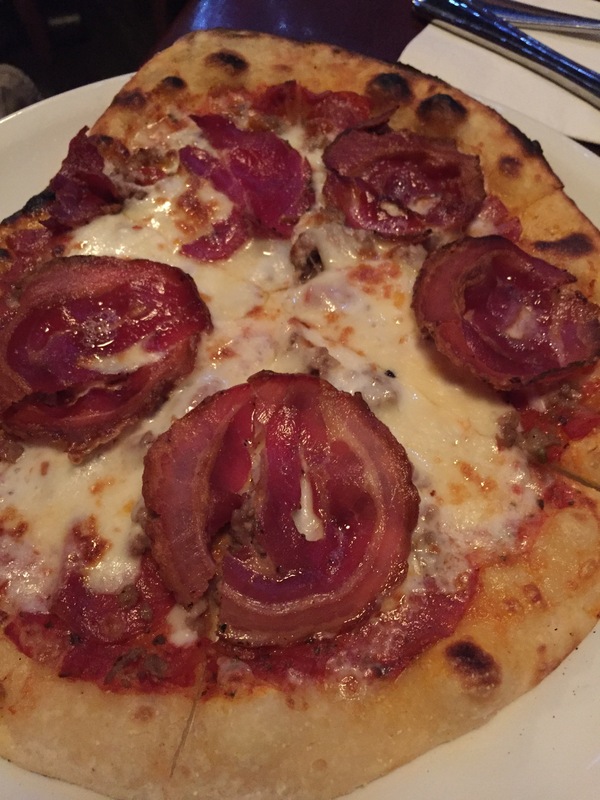 and boyfriend had the Carne d’Italia Flatbread. I do not recommend a rollercoaster after all this food. The night events proved a little difficult because of scheduling. I really wanted to see Fantasmic!, the nighttime firework/laser/Mickey-fighting-villains show, but the end of the show overlapped with the start of the fireworks, Star Wars: A Galactic Spectacular. But we made it work. Before Fantasmic! was over, we did some major speed-walking to the fireworks area and established our domain there (and I may or may not have shoved a kid with me leg who came up into my space last-minute and literally leaned all over me – survival of the fittest, y’all). The fireworks show is amazing, so I highly recommend making it a priority for your visit to Hollywood Studios, especially if you’re a Star Wars fan! Since we had extra magic hours, we spent the remainder of the night getting our fix of the Rock ‘n’ Roller Coaster – we managed to ride it three or four times in a row before the line started backing up. We walked back to Toy Story Mania! for one more go and managed to ride it three or four times before the park closed. What are your favorite things to do at Hollywood Studios? Do you have a favorite restaurant? Which new area are you looking forward to the most, Star Wars or Toy Story? Let’s be honest. Today was way more about Beauty and the Beast than Mickey Mouse (no offense, Mickey). 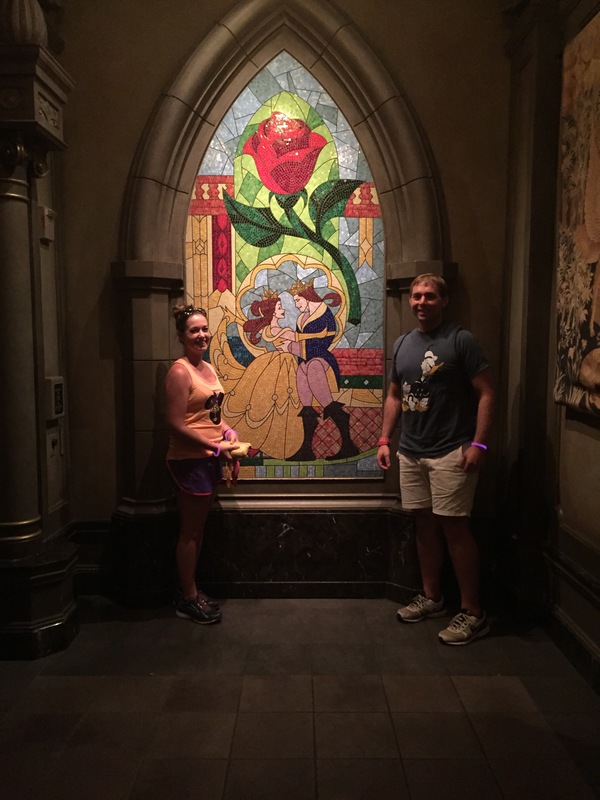 The number one thing I wanted to do during our visit to Disney World was eat at Be Our Guest, the restaurant inside Beast’s castle. When I tried to make reservations on our Disney app, nothing was available, and I was an extremely pathetic and mopey 30-year old. But apparently boyfriend has magical powers. He came in the next day with a reservation. How he did it, I have no idea, but I was so happy, and even happier when the evening finally arrived! Sometimes people will overhype a restaurant. I hate that feeling because you end up with so much disappointment. I am not overselling Be Our Guest, trust me! The restaurant is so beautiful, and the food is absolutely amazing! It was by far our favorite meal. The Grand Ballroom is gorgeous (my pictures are a little dark since it was 9pm), but we were taken to a table in the West Wing (yessss!). It’s gloomy, dark, and a lot of the decorations are ripped, but it was so incredible. The rose is in this room, and about every 20 minutes or so there would be a flash of lightning and thunder (not so loud that you jump and spill your food), and then the portrait of the prince on the wall would change into the Beast! Our waiter was also incredible. He made us feel like we were the only couple in the restaurant, and I loved how into his character he was, constantly referring to the Beast as “master,” and giving us updates on when “master” would be making his rounds to the different rooms. Mickey’s Not-So-Scary Halloween Party was also happening; I don’t usually deck myself out in glow necklaces and bracelets. And without further ado, what you really want to hear about and see…the food! I ordered the Grilled Strip Steak with Garlic-Herb Butter and Pommes Frites. Y’all, it was amazing. I was actually really sad when I ate my last bite. Even the fries were outstanding (and boyfriend kept reaching over to eat them. Unacceptable.). At our waiter’s recommendation, boyfriend ordered the Roasted Lamb Chop. Personally, I thought mine was way better. And of course I tried the Grey Stuff!!! And yes, it was delicious – and yes, I sang that part of the song ALL DAY leading up to this. Tonight’s Grey Stuff was over a chocolate brownie-like dessert. I’m not sure how to describe it – it was similar to a brownie, but didn’t have brownie consistency? Whatever it was, there wasn’t a crumb left. Boyfriend went with a Strawberry Cream Cheese Cupcake (with a strawberry mousse filling). And just when I thought dinner couldn’t get any better…it did. 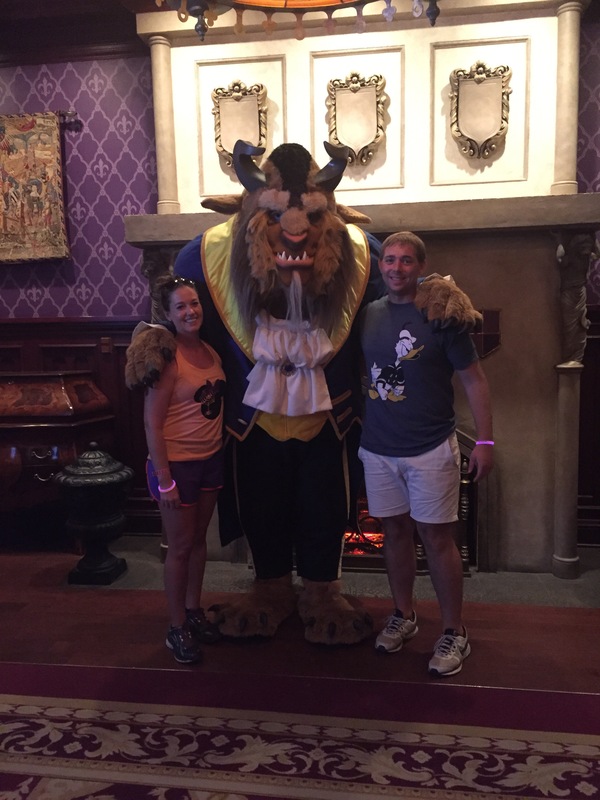 We were definitely the oldest people in line for pictures with the Beast. I was certainly the most excited, though, and totally impressed him with a curtsy. Take that, little kids. Reservations can be made up to 180 days in advance, and for popular restaurants like this one, they usually get booked immediately. Dinner menu can be found at this link. 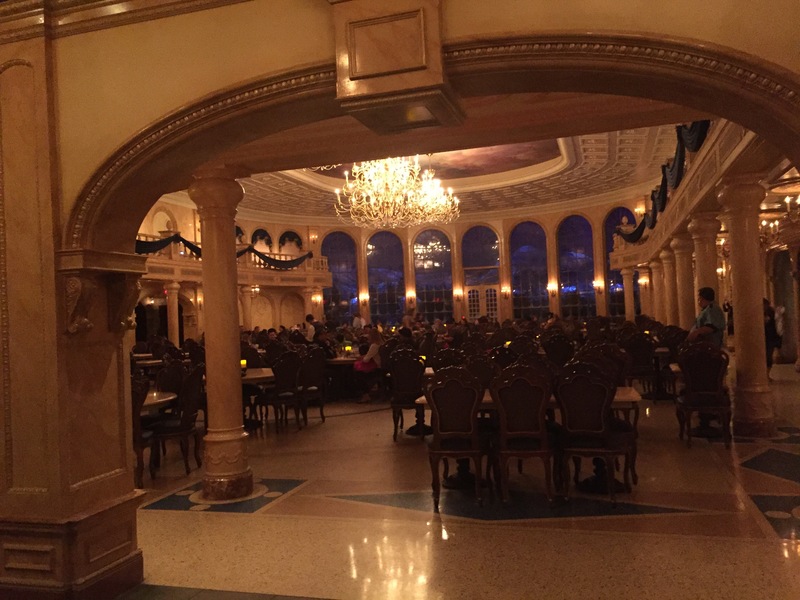 Have you eaten at Be Our Guest? What was your experience like? 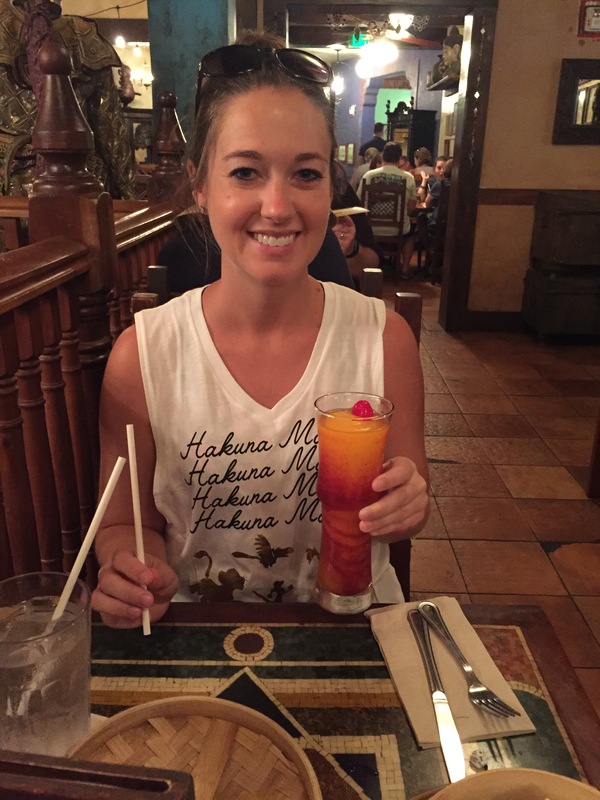 Do you have other favorite restaurants at Magic Kingdom? 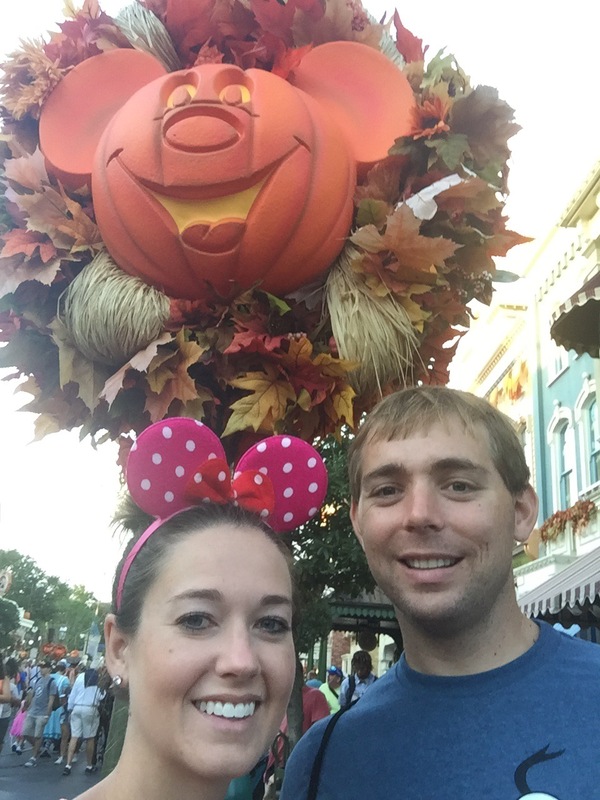 Thursday was our designated day for Magic Kingdom for a couple of really lucky reasons. 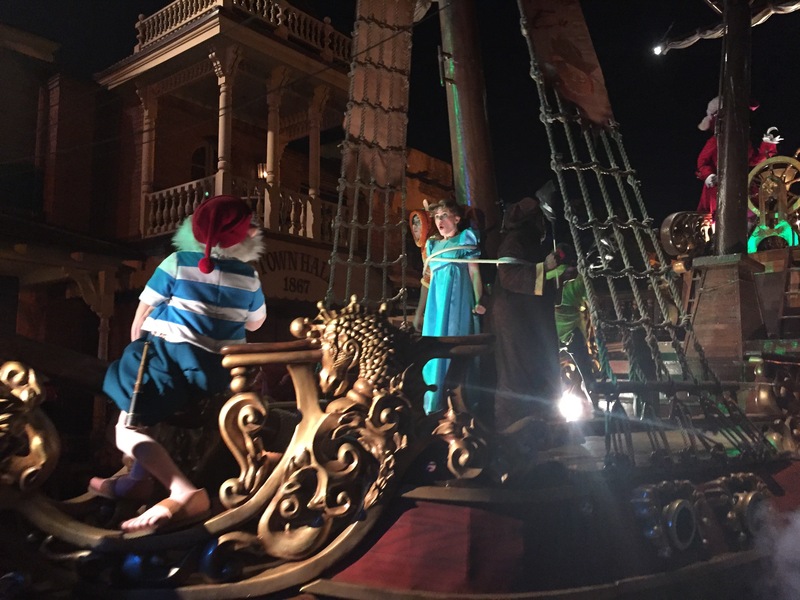 That was the day boyfriend had managed to snag a coveted reservation at Be Our Guest, and Mickey’s Not-So-Scary Halloween Party (MNSSHP) was also scheduled for that night. I hesitated on buying tickets to the party because 1) it’s extra and kind of expensive, and 2) because I was worried it would be too kid-based. It’s definitely worth the splurge at least once. The closer to Halloween you get, the more expensive the tickets are, so you might want to take that into consideration if you’re planning on being at Disney during those times. We would’ve had to leave the park at 7 if we hadn’t bought tickets to the party; party tickets kept us in the park until 1 a.m. I had never been to Disney during the fall, but the park is decked out in its harvest colors and pumpkins are everywhere! We arrived at the park before it officially opened, like good little Mouseketeers, and while everyone else was making a beeline for the Seven Dwarfs Mine Train, we ran to Space Mountain. I was well into my teens before I actually rode Space Mountain (and would like to apologize to my parents for all the times I denied them the joy of riding this because I was too chicken). We were a few of the first people on the ride and should’ve ridden it again because when we went back that evening it was…you guessed it! Broken. We skipped by the entire Storybrook Circus area. It’s mostly for small kids. Our next stop was Ariel’s Grotto area which was new to us, and we hopped on Under the Sea – Journey of the Little Mermaid. Boyfriend must have a thing for princesses because this was another ride he requested to do a second time later during the day. We didn’t have a wait, but there are some interesting activities in the queue if you are in a long line. I now can’t get “Under the Sea” out of my head. After “oohing” and “ahhing” at Beast’s Castle, I dragged boyfriend to Enchanted Tales with Belle. This is a reenactment of the story, and we were BY FAR the oldest people there without children and being there was the only real time I felt kind of creepy. I still wanted a part in the play but got denied. Little kids will freak out over this, but unless you’re there with a bunch of adult friends, your time might be better spent elsewhere. The “manliest of manly places” according to the Disney site. We had only completed three activities and were already hungry. We kept seeing people with giant cinnamon rolls walk out of Gaston’s, so going inside for food seemed like the only logical thing to do. The next logical thing to do was order a giant cinnamon roll, a ham and cheese pretzel, and LeFou’s Brew (it’s frozen apple juice with a hint of toasted marshmallow, topped with passion fruit-mango foam). I know, I know. What a weirdo combo – but TRUST ME. Freaking amazing. I want to go back just for LeFou’s Brew. We got in a ton of rides before finding our parade spot and basically just worked our way from Gaston’s Tavern counterclockwise around the park. 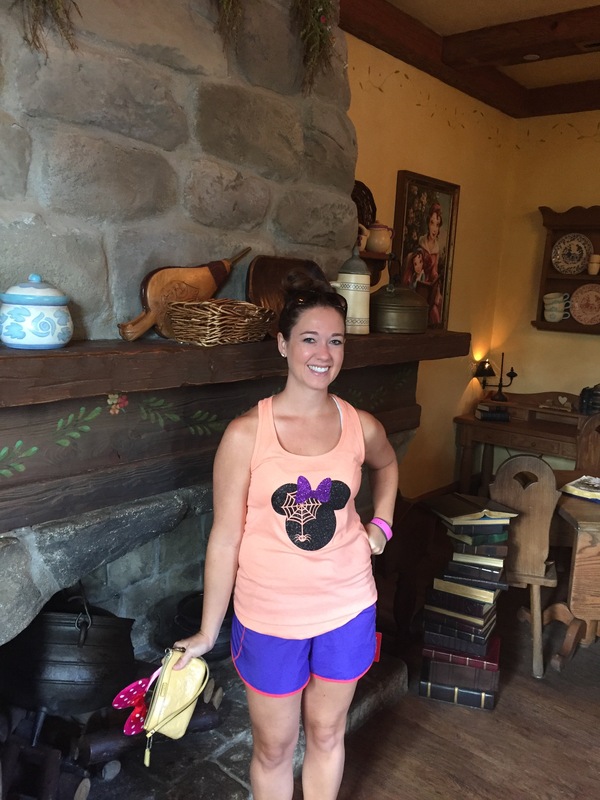 We had a FastPass for the Seven Dwarfs Mine Train (thank goodness!) – when we passed the ride around 10 there was already a 2+ hour wait. We got in “it’s a small world,” Peter Pan’s Flight, Splash Mountain, Haunted Mansion, the Country Bear Jamboree (so many sites say to skip this, but I think it’s hilarious and boyfriend had never seen it), and we rode the boat over to Tom Sawyer Island which I had never done (and won’t do again). The only picture from the Festival of Fantasy Parade – clearly Beauty and the Beast is my favorite movie. We had a perfect spot for the parade and it was nice to stand there and dry off from Splash Mountain. After the parade we needed refueling; I had a plan. Boyfriend did not. 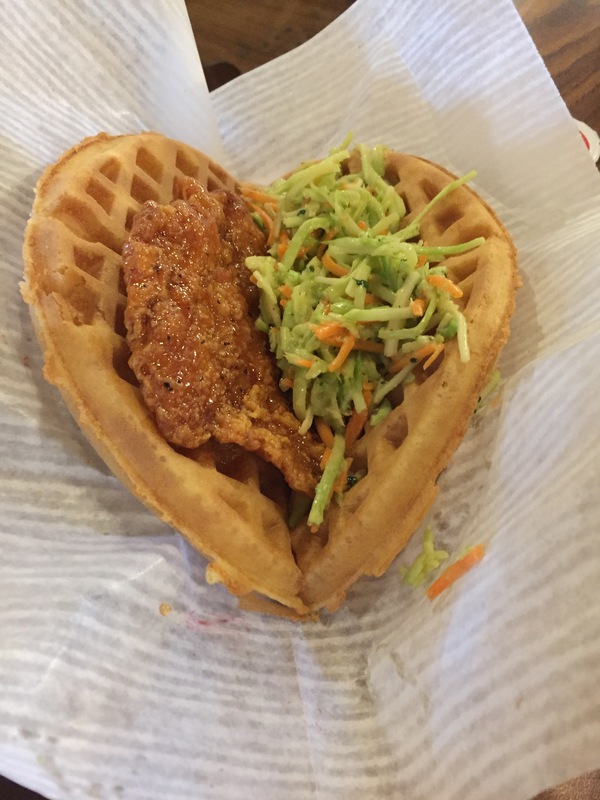 Since we were super close to the Sleepy Hollow kiosk, I opted for a Sweet and Spicy Chicken Waffle Sandwich which was pretty tasty! Boyfriend wanted something from the Pinocchio Village Haus, so I took my waffle there. There’s plastic glass on one side of the restaurant facing “it’s a small world,” so we entertained ourselves by watching the boats load. After our lunch break we fit in most of our other rides: Pirates of the Caribbean, Jungle Cruise (we waited forever in this line), and the Enchanted Tiki Room (my mother HATES this show; boyfriend had also never seen this one – one time every ten years might be enough, tbh). Then it was time for my first Dole Whip! It was a perfect late-afternoon treat to help us cool off (no pic because I ate it so fast). After a show at Mickey’s PhilharMagic we came back to Adventureland for The Magic Carpets of Aladdin (totally a kids ride, but hey, I’m a kid at heart). 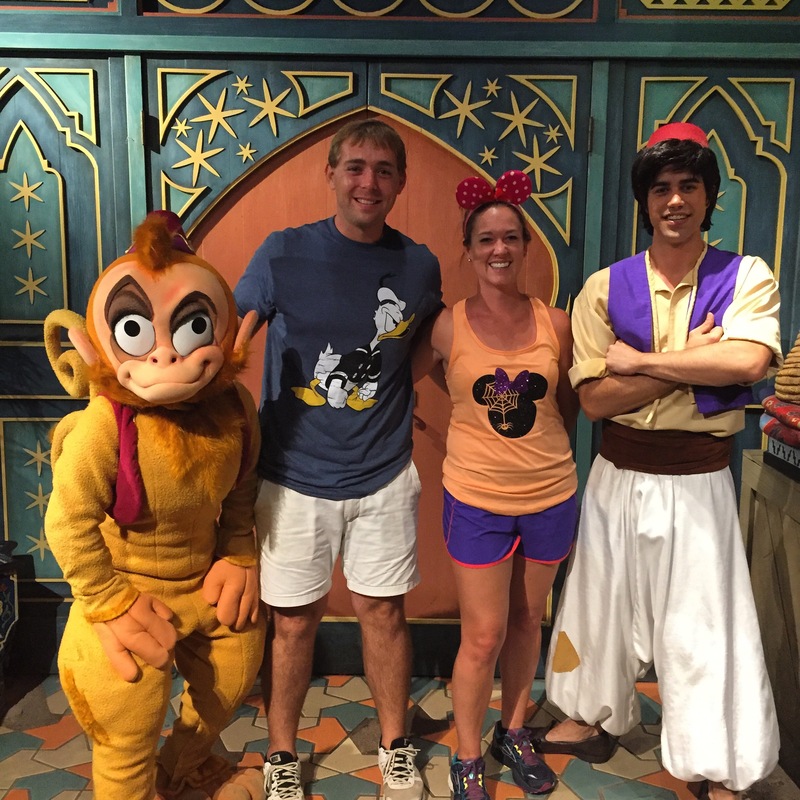 While we were riding the magic carpets I saw Aladdin and Abu! I wasn’t about to pass up a photo op! And again, the oldest people in line. No shame. 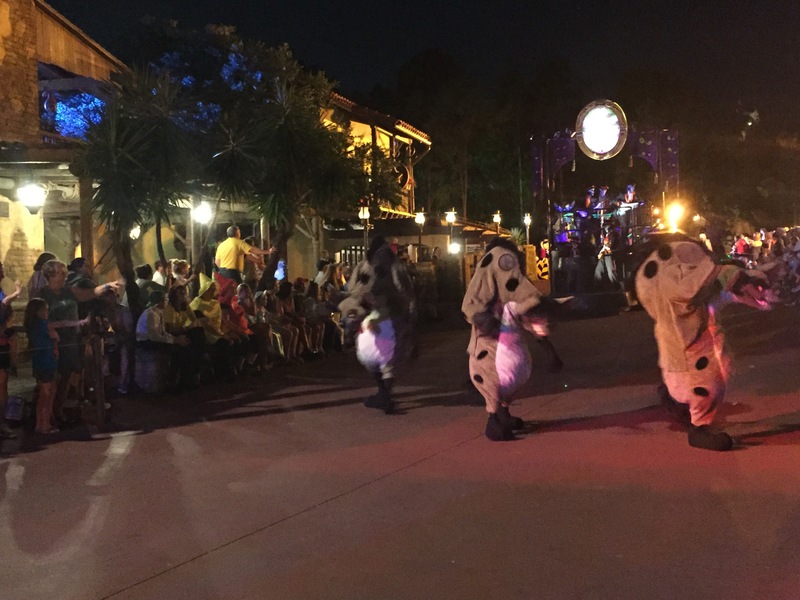 We found some prime space for the Boo-to-You Halloween Parade which usually takes place twice during the party. We opted for the later parade – everything I read said to avoid the early one because all the kids were there and left by the time the later parade happened. I loved this parade because it featured a lot of characters, especially villains, you can’t typically find around the parks (the hyenas from The Lion King, below, were hilarious), and the parade begins with the Headless Horseman riding through the streets. Warning: the song they sing throughout the parade WILL get stuck in your head forever. Earlier in the day we had picked up our wristbands for the Halloween Party. When you get your wristband you also get a bag for trick-or-treating around the park (that already has candy in it!). We hesitated to actually go to the trick-or-treating stations, but nobody looked at us weird, other adults were doing it (and dressed up in super impressive costumes! ), so we jumped right in! Who doesn’t like Disney + free candy!? Before the final show we hit up Buzz Lightyear’s Space Ranger Spin, a peaceful ride on the Tomorrowland Transit Authority PeopleMover where we could see a lot of the park lit up, and then a nighttime ride on Splash Mountain. I highly recommend riding Splash Mountain at night because the park is beautiful to see right before the big drop. And then at midnight we had the Hocus Pocus Villain Spelltacular in front of Cinderella’s Castle featuring the Sanderson Sisters from Hocus Pocus and all their Disney villain friends! I highly recommend this show, especially if you like seeing the Disney villains! The park was open for a couple more hours, but we were absolutely exhausted. I have no idea how some of those kids were making it. If you’re debating on whether or not to attend Mickey’s Not-So-Scary Halloween Party, I highly recommend doing it at least once! Even if you’re adults without kids! *Big Thunder Mountain Railroad was closed for refurbishments during our trip (so sad! ).